Tartines are the French equivalent of bruschetta, usually made with leftover baguettes and most often served for breakfast. The Accidental Locavore’s husband saw this recipe and thought it looked interesting so I made it for lunch the other day. It’s pretty easy and easily adaptable. This fed 2. 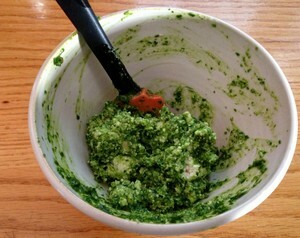 To make the pesto, put the garlic, parsley, lemon zest, salt and pine nuts in the work bowl of a small food processor. Process into a coarse paste. Slowly add the oil and process until combined. Stir in the ricotta. Preheat the broiler. Heat the olive oil over medium heat in a sauté pan. Add the mushrooms, season with salt and pepper and cook until golden brown. Cut the baguette in half the long way and toast until lightly toasted. Put on a small baking sheet (or piece of aluminum foil). 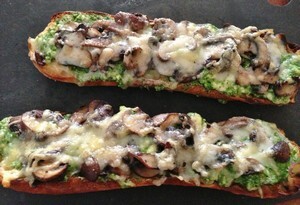 Spread with the pesto. Top with the mushrooms and grate some fresh nutmeg over them. Add the cheese. Put them under the broiler and cook until the cheese melts. Serve and enjoy! My verdict: This was a really good fall lunch. Not that it was terribly difficult, but to make it easier, I would just use some pesto from the fridge and stir in some ricotta. 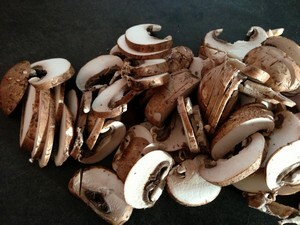 Any kind of mushrooms would be good and I would probably add a little garlic to them when I cooked them. The original recipe called for cheddar, but I thought Gruyere might be a better match. As I said in the intro, it’s easily adaptable for what you have on hand.